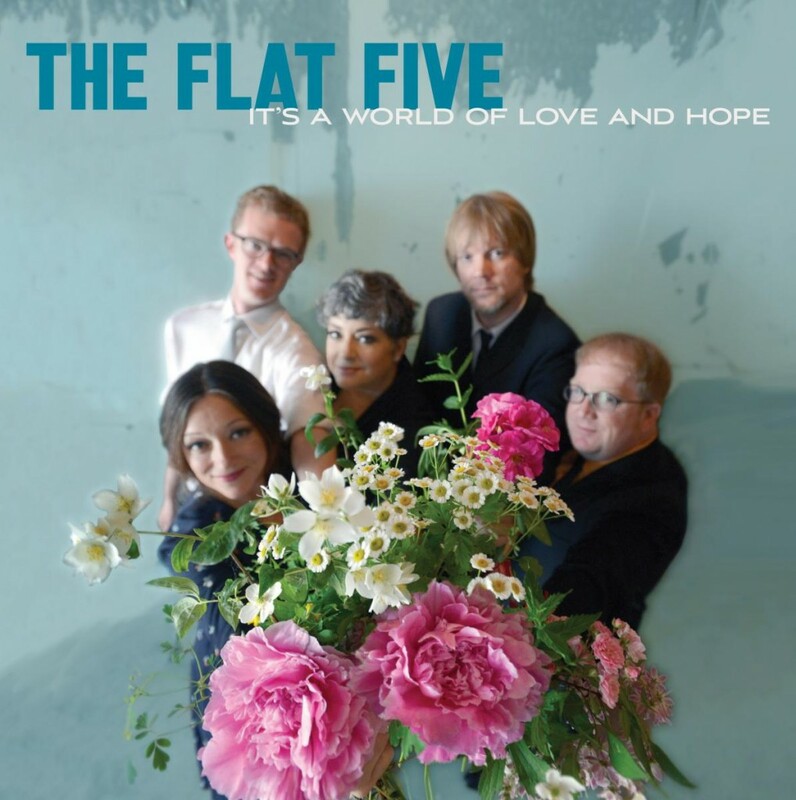 The debut album by the Flat Five, It’s a World of Love and Hope, is a strange and wonderful thing. I doubt you’ll hear any other record this year that sounds anything like this. It feels like a throwback to some other era … but when, exactly? And what exactly is this? Bubblegum pop? Psychedelic rock? Vocal jazz? Power pop? Country? Cabaret? Lounge music? It has a little bit of all that. The vocal harmonies and varied instrumental flourishes are delightful, and the songs are utterly charming, with the catchiest of melodies and offbeat, whimsical words. Like the best music, it doesn’t really need an explanation — just listen to it, and I bet you’ll fall in love with it. But here’s the back story: The Flat Five is a sort of supergroup within the world of Chicago alt-country and related genres. The group brings together five highly talented musicians — and it requires something like a Venn diagram to keep track of all the bands they’re connected with. There’s KELLY HOGAN, a terrific singer who is Neko Case’s regular harmony vocalist — and a great solo artist in her own right. In the Flat Five, she sings alongside another outstanding vocalist, NORA O’CONNOR — who played guitar in the Blacks, released one excellent solo album, and has performed with artists including Andrew Bird and Iron & Wine. Hogan and O’Connor have both sung with Mavis Staples and the Decemberists. The Flat Five also features SCOTT LIGON, a virtuoso on both guitar and keyboards, who also sings and writes music. And there’s bassist CASEY McDONOUGH, who also sings and writes. In addition to playing in the Flat Five, Ligon and and McDonough are members of the legendary rock band NRBQ’s most recent lineup. Their repertoire stretches from “Vanishing Girl” by XTC alter ego the Dukes of Stratosphear to Hoagy Carmichael’s “Lazy Bones.” Calling them a cover band hardly does them justice … they’re writing their own definition of what a standard should be as they have a blast interpreting a genre-defying mix of folk, jazz, soul, and soft rock. Since 2007 they’ve played just three times, convening for one night each December at the Hideout. It’s a nice holiday tradition, but I’d sure like to hear those sublime harmonies more often. But Flat Five hasn’t made any records until now — the new album is out today (Oct. 14) on Chicago’s Bloodshot Records. Now, here’s the other thing you should know to understand what this album is all about: Scott Ligon has a brother named Chris Ligon, who has made a series of independently released records filled with oddball tunes. (They’re so far underground that I can’t find a good internet link to include here.) Chris Ligon is married to the cartoonist Heather McAdams, who used to create an annual calendar packed with country music pictures and trivia. For many years, the couple sold these calendars at Chris & Heather’s Country Calendar Show, an annual shindig at FitzGerald’s that brought together a who’s who of Chicago’s alt-country musicians. The Flat Five often sprinkles a song or two by Chris Ligon into its sets — including a hilariously scatological ditty called “Poop Ghost” — and now, the group has made an entire album of Chris Ligon covers. I interviewed Kelly Hogan and Scott Ligon in October 2014, when they were just getting started on this recording project. I asked Scott, “Why don’t you describe what your brother is all about, musically?” And he replied: “I can’t describe what my brother is all about. I really can’t. To me, that music is completely singular. There’s just nothing like Chris Ligon. There’s nothing like what it is that he does.” That isn’t the most satisfying answer, but I can see why Scott had trouble putting in words what exactly Chris’ music is like. The songs tend to be weird and whimsical. Somehow, it sounds like his melodies and arrangements are following the usual songwriting rules while subverting them at the same time. This week, Scott wrote more about his brother’s music and their friendship in a touching and amusing Facebook post. Knowing all of that history, I was confident the Flat Five’s record would be good, but it was hard to know exactly what to expect. The resulting album is such a pleasure to hear because it dares to be different. If you’ve ever seen the Flat Five in concert, you know these are stellar musicians and singers who can blend their voices and instrumental parts in a way that looks and sounds effortless — though I’m sure it’s actually the end result of years of experience and work. Those skills are apparent on the record, too. Their voices flit around in the mix, joining together for delightful harmonies at key moments but also playing off one another in animated conversation. At times, the Flat Five sounds like a jazz vocal harmony group — think the Manhattan Transfer or the Swingle Singers — or maybe a doo-wop act, singing nonsense syllables like “zip zip boom boom.” But that’s far from the entirety of what the Flat Five does. After moments that verge on novelty music — with jokey lyrics about subject matter like a bug-zapping light — the record slips into other styles. There’s a jazzy organ solo on the finger-snapping number “You’re Still Joe,” a burst of brass on the wistful country ballad “Birmingham,” and a soaring chorus on the bright rocker “Almond Grove.” And all of these elements fit seamlessly together, with smart and satisfying sonic arrangements. The final track on It’s a World of Love and Hope is titled “It’s Been a Delight,” and it puts the focus on the Flat Five’s smooth harmonies, with all those splendid voices cooing farewell. It’s been a delight indeed. The Flat Five plays a record release show (sold out) on Oct. 22 at the Old Town School of Folk Music, with none other than Chris Ligon as the opening act. There’s also a free show at 5:30 p.m. today (Friday, Oct. 14) at Val’s Halla Record Store, 239 Harrison St., Oak Park. And the group will be back for a concert Jan. 6 at City Winery in Chicago. Look for tour dates on the Bloodshot Records website.